The following excerpt is taken from Khutba of al-Mansur on the Id al-adha, 335 (2 July 947). During the siege of Abu Yazid at Kiyana. Noor Mowlana Al-Mansur was our 13th Holy Imam and the third Fatimid Caliph. "Most truly this day of yours is a sacred day during a sacred month, made more significant than other days, a day of the greater pilgrimage, in which God, the hallowed and exalted, tested Abraham His friend. He was redeemed in it from slaughtering his son, may God bless them both, and God imposed on the whole people of Islam the obligation of pilgrimage to His sacred house, which He made a refuge for the people and a place of safety. So draw closer to God the Exalted in it by means of what He has commanded you to do. The most worthy of what brings you to him is the female of a camel, and the female of cattle, and the ram of sheep. Steer clear of sick animals and those with defeats in the eyes or ears, and those of them deformed by excess in its creation or something missing. They will not be accepted on your part. This is in accord with the practice of your Prophet, may God bless him and keep him and his family, the Imams among his pure progeny, the righteous and highly esteemed, on them the most excellent of salutation. 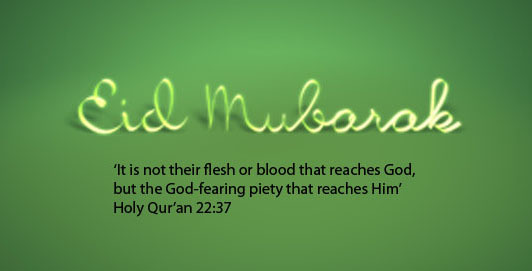 'It is not their flesh or blood that reaches God, but the God-fearing piety that reaches Him' [Holy Qur'an 22:37]." The forms of sacrifice are diverse but the essence is the God-fearing piety which is the means of coming close to He who is above all else. On the occasion of Idd-ul-Adha, examples of material sacrifices can be in form of animals or donations to promote the well being of all societies. During the Golden Jubilee of Noor Mowlana Hazar Imam, the forms of sacrifice were grouped as material or in form of time and knowledge. However, the essence of all that is being done is just for the pleasure of the Holy Imam. Therefore, each one of us has to re-examine the purity of our niyat (intention) and actions (amal). We have to do these at the highest standard of God-fearing piety as demonstrated by Hazrat Ibrahim (a.s.) and Hazrat Ismail (a.s.). Is it possible for us to bow in utmost humility and submit ourselves to vision of our Holy Imam? The answer is a resounding 'yes'! Part 2: What Are the Rewards of God-Fearing Piety? "I prescribe for you, the servants of God, what I previously prescribed for myself as to fearing God and His surveillance, and doing what will please Him and bring us and you closer to Him. So, in fearing Him, there is His approval and, in His being pleased, success in paradise and salvation from the fire. And 'whoever is saved from the fire and admitted to paradise has been granted success; and the life of this world is but the merchandise of delusion' [Holy Qur'an 3:185]"
"People have been created as a proof of (His) power, have been brought up with authority, they are made to die through pangs, and placed in graves where they turn into crumbs. Then they would be resurrected one by one, awarded their recompense and would have to account for their actions, each one separately. They had been allowed time to seek deliverance, had been shown the right path and had been allow to live and seek favours, the darkness of doubts had been removed, and they had been let free in this period of life as a training place in order to make preparation for the race on the Day of Judgement, to search the objective with thoughtfulness, to get time necessary to secure benefits and provide for the next place of stay." "How appropriate are these illustrations and effective admonitions provided they are received by pure hearts, open ears, firm views and sharp wits. Fear Allah like him who listened (good advice) and bowed before it, when he committed sin he admitted it, when he felt fear he acted virtuously, when he apprehended he hastened (towards good acts), when he believed he performed virtuous acts, when he was asked to take lesson (from the happenings of this world) he did take the lesson, when he was asked to desist he abstained (from evil), when he responded to the call (of Allah) he leaned (towards him), when he turned back (to evil) he repented, when he followed he almost imitated and when he was shown (the right path) he saw it. Such a man was busy in search of truth and got rid (of the worldly evils) by running away. He collected provision (of good acts) for himself, purified his inner self, built for the next world, and took with himself provision for the day of his departure, keeping in view his journey, his requirement and position of his need. He sent ahead of him for the abode of his stay (in the next world). O creatures of Allah, fear Allah keeping in view the reason why He created you and be afraid of Him to the extent He has advised you to do. Make yourself deserve what He has promised you, by having confidence in the truth of His promise and entertaining the fear for the Day of Judgement." "You are the supporters of Truth and brethren in faith. You are the shield on the day of tribulation, and (my) trustees among the rest of the people. With your support I strike the runner away and hope for the obedient of him who advances forward. Therefore, extend to me support which is free from deceit and pure from doubt because, by Allah, I am the most preferable of all for the people."